My mother is a very playful woman, always up for a joke a prank or a trick, not a bad student in her younger days but definetely the one I would describe to a salesperson when I'd be lost in a department store as the "short woman laughing". So when she arrived from France on Monday for a mini vacation without my father, I wanted to accomodate her playful nature. I put one of these "verrines" (can be translated as dessert in a glass) in front of her that evening and waited for her reaction. I was not waiting for a "wow" but for a giggle and this is exactly what I got! She looked at it, picked it up, turned it around and then said like a kid who just found a Rubix cube "Come on! Tell me, tell me...!" 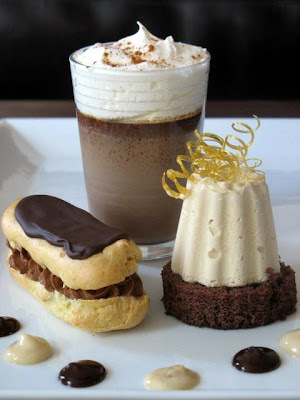 Well, mom it's really not complicated and I owe it all to Pierre Herme, the mad pastry scientist/creator we all worship! I had originally worked on it for a tasting for an event that never happened so I had three of them left for us. You probably know by now that every Sunday I tutor Veronica in French and that we start and end our sessions by talking pastries and desserts. We always talk about Herme, and we often end up emailing each other about pastry suppliers, books, discoveries and others. 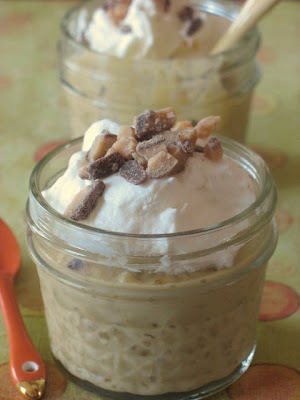 One afternoon I was reading emails when Herme's newsletter came through and within 10 seconds I was forwarding it to Veronica with a simple "I am So making THIS during the week!" 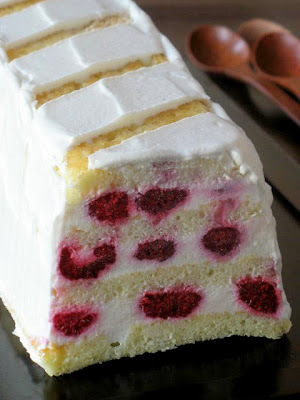 I had not even looked at the ingredients yet, I just loved the play on the layer. In the newsletter, there was a link to the recipe and I thought "And he is generous...I love that!" I read it, I liked it but I found the actual making a little bit tedious due to the ingredients. 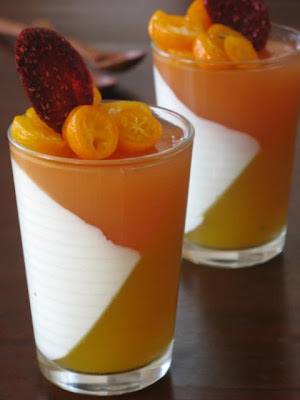 His original version contains a bottom layer of orange marmelade then a layer of yogurt panna cotta and the top layer is passion fruit gelee. I thought that orange marmelade would be cloyingly sweet and although I found passion fruits at the store, they were $1.99 a piece...and I needed 20 if I were to follow his recipe. Ah yes, the man is generous but he is not sponsoring my site...so I had to change course and come up with my own Sensation Satine, keeping the fun look of the different layers. Think about an upscale jello that is a cinch to make. I am sure that if Herme knew what jello was, he would kill me for the comparison but this is the closest I could get! There is not a whole lot of gelatin in each layer, just enough to old everything together and leave an extreme velvety texture to each bite...like satin. I went for grapefruit at the bottom, honey Greek yogurt in the middle, and mango lime for the top. To garnish I macerated kumquats in simple syrup overnight and the little extra is a raspberry chip on top. The chips are so easy to make that you are going to start using other fruits. Mangoes, bananas, strawberries, etc... They are addictive! It was time to tell mom how Herme did it and how I shamelessly copied him! All you need is a few glasses and an empty egg carton...Yes! An egg carton! Everytime you layer an element, set it at an angle in one empty egg slot, refrigerate until set. Layer the other element and set this one on an opposite angle, the top layer goes flat. When I read it I thought "and there you have why he is among the Masters in the world...duh!!" And my mom to exclaim in her usual fashion: "How cool! Let's do it again!" I see her point, once you have the concept, the possibilities are endless! Granted the process takes a long time because of the setting periods of each layer but you can spread it over one cleaning and laundry day....or one lazy rainy afternoon. Pour the water into a small container, sprinkle the gelatin over it and set aside. In small saucepan set over medium high, heat together the mango juice, the sugar and the zest and juice from the lime until the sugar is dissolved. Remove from the stove, add the gelatin and stir until it is completely melted. Let cool to room temperature. Divide evenly among the glasses and position them at an angle in the egg carton. Let set a couple of hours in the fridge. Pour the water into a small container, sprinkle the gelatin over it and set aside. In a small bowl, heat half the yogurt in the microwave for one minute. Microwave the gelatin for 15 seconds. Quickly mix the two together, add the rest of the yogurt and the honey. No need to let it cool, layer it on top of the mango layer and position it at the opposite angle in the egg carton. Refrigerate for a couple of hours. Same exact process as the mango layer. Let it cool to room temperature before using. Remove the glasses from the egg carton and divide evenly on the top of each glass. Refrigerate for a couple of hours. In a large saucepan heat to boiling the water, sugar and 3 crushed cardamom pods. Remove from the heat, and let infuse for 30 minutes. Strain the syrup into a bowl to remove the cardamom and add the sliced kumquats, leave to macerate for couple of hours or overnight. In a food processor puree the raspberries with the sugar until smooth. Line a baking sheet with parchement paper and with a spoon or a spatula, spoon small petals or chips. Bake at 200F until dried and firm to the touch. They will firm up while cooling but get soft if refrigerated. Last but not least: the winners from the Canneles drawing held this past weekend. I would like Megan from Megan's Cooking and Paula who signed "anonymous" to email me their snail mail address at marinette1ATcomcastDOTnet so I can get these puppies out to them. Congratulations!! 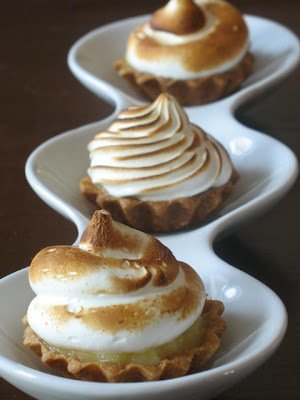 Or in my case Lemon Meringue Tartelettes...yep, can't escape that nickname but to my defense Jen from The Canadian Baker and hostess for this month Daring Bakers' challenge had given us the option to make several tartelettes instead of one large pie. Be prepared to bathe in deliciously tart lemon curd and come out all sticky of meringue as 450 Daring Bakers got all sticky gooey once more just for you....and to overcome their fears, baking issues or just to have some fun! Although this was not my first lemon meringue pie, it was fun to use someone else's recipe for crust and curd and compare them with the ones I constantly use. No big challenge but I was so tired the day I made it that I really did not pay close attention and followed the recipe blindly. Hint to those DB who have to use violent threats to themselves to follow a recipe to a "t"...do it when you can barely stand on your feet from exhaustion, physical or mental. Mine was mental so I went ahead and dove in. The crust turned out ok, not my favorite but very good. I like mine flaky with good ole Crisco. Since my mother in law gave me her recipe, I just think this is the best (and not too many worries for my arteries I use the non trans-fat one that came out a couple of years ago). This one did the trick, except that being on auto-drive that evening I added the whole measurement of cold water to the flour mixture instead of my usual a few tablespoons at a time until it comes together. Oopps...dough was wet...Wrapped it up, parked it in the fridge for an hour, with the absolutely faith (that means all digits crossed here) that the flour and butter would work their magic and tame their thirst with the extra moisture. Worked! People, never fondle your dough too much no matter how soft and shiny it is or you will pay the price of tough and too elastic a piece to work with! After that a familiar scene happened: roll the dough, cut rounds, fill tartelettes molds, cover with parchment paper, fill with dry beans, blind bake and let cool. Oven on, tired Tartelette...I almost forgot they were in when the neighbors gathering for drinks started to wonder what I was baking! I had forgotten we had planned a game of Scrabble. On to the curd....now I had an audience...ahahahah!!!! Most likely they will be too invested in the game to notice if I mess up! It wa the first time I used a curd recipe that involved water and which method was slightly unsual (see the recipe below). I have been spoiled by the lemon curd in Alice Medrich's book on low fat dessert and the fantabulous full fat lemon cream from Pierre Herme. But eh! I am always willing to try something new for my lovely Daring Bakers!! Everything went smoothly and the curd turned out smooth and tart, just like I love it. I remembered the good old advice from Harold McGee not to stir the cornstarch mixture too vigorously and not to cook it passed boiling or it will reverse its thickening properties...amazing given I was completely distracted by C. challenging B. about a word during our Scrabble game. Kids......! The meringue part....delicious. Again, of where there is fluffy sugar topping there usually is a happy Tartelette. The recipe instructed us to use the oven for that part, but my oven was crowded with pizza when that part came up so I "had" to use the blowtorch (another excuse to play with fire) and for the kids to be convinced I had magical powers!! I first played with it on the tartelettes like I had done previously on lime meringue cupcakes and then I just used a plain tip and a large star tips and did the minis with them...and they kind of looked like cupcakes after all. I think I lost at Scrabble but I took the prize for eating the most of the mini lemon meringue pies in one sitting. What can I say...I love anything with lemons! 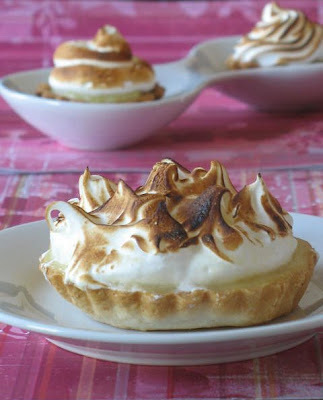 Will I make this particular lemon meringue pie again? Actually I did a couple of times for a friend and my mother in law and everybody enjoyed it. For us? Probably, not so much for the crust but the curd was really tart...which I love, so I will make sure to serve it to people who share the same fancy. 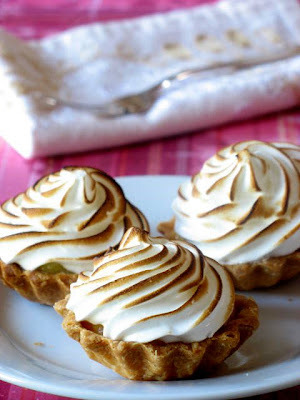 The meringue was not overly, cloyingly sweet so it will be used again for other tarts. 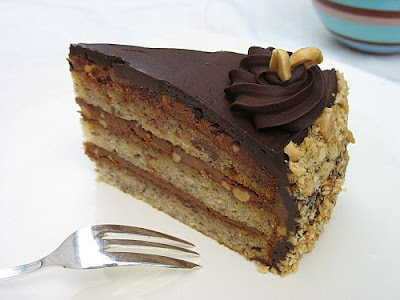 Be sure to check my fellow Daring Bakers' posts popping out there everywhere and thanks Jen for a yummy recipe! Makes one 10-inch (25 cm) pie. I made four 3.5-inch ones and twelve 2-inch minis. And remember that you have until 4pm today to get the chance to get yourself a box of canneles! I am offering two packages of a dozen each of fresh baked canneles to two gourmands out there. All you have to do is leave a comment to this post and I will draw your name completely at random and ship them to you during the week. To ensure freshness I can only ship within the US and Canada. 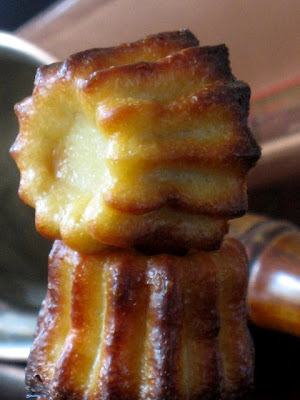 A lot has been said about Canneles [kah-nuh-leh] : they taste like a fudgy bite of crepe, they are moist on the inside and crispy on the outside, they have a faint hint of rum, etc... I need to add that they are hands down good and truly addictive! I am on batch number 3 and the neighbors only got to try a dozen...Yes, my name is Tartelette and I am a canneles addict. Actually, I am blaming Veronica for this week's thigh expansion! You see, every Sunday I tutor her in French for an hour and we usually start our lesson with a rundown of the recipes we tried the past week and we end it with a exchange of the recipes we plan on trying. This past Sunday we prolonged the hour by talking baking resources online, utensils and molds. It reminded me of the silicone canneles molds my parents brought me last September that had not been used yet. Tragedy!!! So you all can guess what I did right after we said goodbye...and again the next night! I blogged about Canneles last year when I could not wait to get the proper molds and decided to use muffin tins. The experience was successful, after all, appearances are one thing, taste is what matters. However, I could not resist their dainty cute shape and decided to rework the first recipe I made. They are a specialty from the South West town of Bordeaux, but you can bet that good as they are they finally made their way to most bakeries in France, especially Paris. When we were home last year, we got half a dozen (come on people, that's three each! See, I can show restraint!! 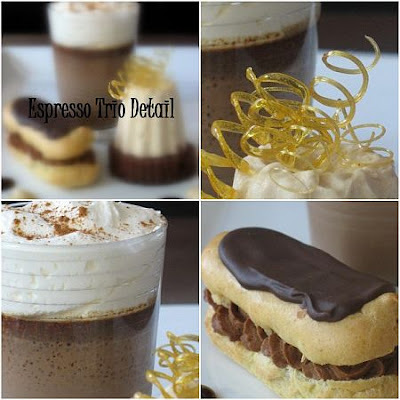 ), from my favorite Patissier Gerard Mulot. I liked his a lot more than most I tried (and believe that for the sake of blogging I did try quite a many half dozen that time), because they retained their freshness the day after unlike most canneles out there. One characteristic of the canneles is that they crust while extremely buttery and crispy fresh from the oven will get moist and soft as the day goes by. Although I could eat an entire batch in one sitting, I was also attempting to share with the neighbors gathered on the patio! I suspected that a little bit more flour than usual would do the trick and I adapted the recipe accordingly. They were still best right out of the oven but even the next day, the moisture had not seeped out and the crust had remained beautifully crispy. Mission accomplished! Most if not all pastry shops in France will coat the molds with beeswax as it does not burn at the high temperature they cook them in as fast as butter and sugar and gives the cakes a nice shiny crust. You can't taste the beeswax at all, but I make canneles when the craving strikes me and I do not usually keep beeswax on hand, plus I was using silicone molds and not copper molds so I figured that part would not work the same! I reduced the oven temperature to avoid burning and bitter caramelization of the butter and sugar and that did the trick. I like canneles on the lighter color side, just my preference versus feeling like I am about to pop a morsel of coal in my mouth, but feel free to push the cooking time a little longer if you are so inclined. One last thing I strongly recommend is to refrigerate the batter at least 4-6 hours or to make it the night before. I started it at noon and we had them to go with coffee and cordials that evening. Funny thing is that I ran out of rum and used Calvados for the second batch...and people around me failed to understand the irony of making a Southern French treat with an alcohol from Normandy. Yes, I know, I am easily amused! In a saucepan, bring the milk to a simmer, add the butter cut into dices. Mix well and let cool to lukewarm. In a bowl, mix the eggs, egg yolks, sugar and vanilla and whisk until foamy. Slowly add the rum and flour. Add the milk slowly and whisk until smooth. Pass it through a sieve if necessary. Let the batter rest in the fridge for a few hours or overnight. When the batter has rested, preheat the oven to 375F, position a rack in the center. 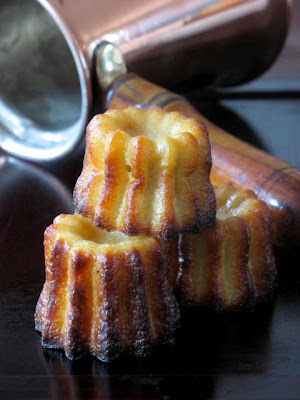 Divide the batter evenly among the canneles molds, generously coated with cooking spray or well oiled if you use copper. Bake for 35-45 minutes. The will be scortching hot right out of the oven, so let them cool 20 minutes or so before enjoying them. Last time they came my parents brought many of my favorite Demarle silicone pans (a bit pricey but so worth it) as well as a couple others they did not have on stock, called Moulflex, cheaper, bright red and a little bit lighter. I was skeptical but grateful at the same time as I did not want to pay for copper canneles molds...Oh trust me I could...they are so pretty and shiny...but I can't justify such an expense to my beloved! The Moulflex ones worked like a charm! The only copper thing I owned is the hot chocolate pot in the top picture that I found at an antique store. Right around mid December, I had that feeling something somewhere was not right but I could not really put my finger on it. Something was missing every time I'd turn on the computer but I could say what. The filling lasted a few days more when suddenly it hit me, "WTSIM..." was missing! Peeps, that's bad when your body has become so trained to certain cycles that it knows when something is out of place. And that's even worse when it is in your "other" life, your blogging life that is. Unless they ask us to make stew or barbecue I am always there to go play with Johanna, Jeanne and Andrew. January's theme is "Terrine" and as I was reading Johanna's directions I almost sighed in disappointment when she said that sweet terrines were welcome. Oh good! Now what?!! I thought about steamed puddings in terrine molds and about nice layered fruit gelatin layers. The former seemed a little heavier than I wanted to bring to our weekly gathering with the neighbors and the latter was going to be received as this weird jello-type dish no matter how sophisticated the layering and fruits would be. I was in the mood for layers of cream and fruits and decided to pair them with a light genoise and assemble the terrine that way. I got lucky at the farmers' market that Saturday and came home with some very ripe and fresh raspberries and homemade yogurt, thick and wholesome. 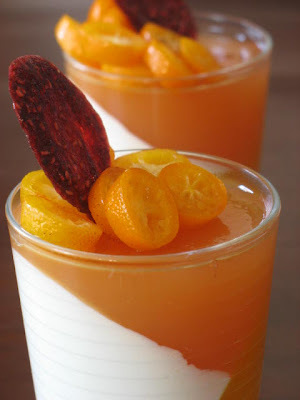 The yogurt is the base for a light and creamy panna cotta flavored with honey. I was inspired by a recipe from The Sweet Life by Kate Zucherman. I was intrigued by this recipe as the other element is a egg white custard. Like most of us out there I am used to egg yolks based custard so this was an interesting play on a basic. I have to say that on its own, it is very eggy tasting...not something I would want to eat by the spoonful like creme anglaise. 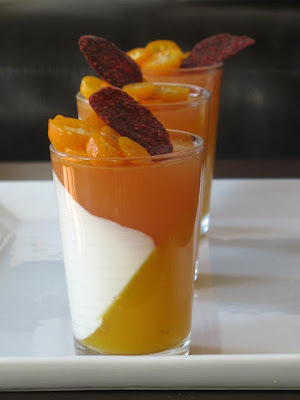 However, once mixed in with the yogurt and honey, the strong egg flavor disappear completely and one is left with a very silky panna cotta. Something I can eat by the spoonful!! one (1) 10 x 15 inch jelly-roll pan that has been buttered and lined with parchment paper and then buttered again. Set a rack in the middle of the oven and preheat to 400 degrees F.
Whisk the eggs, egg yolks, salt and sugar together in the bowl of a heavy-duty mixer. Place over the pan of simmering water and whisk gently until the mixture is just lukewarm, about 100 degrees if you have a thermometer (or test with your finger - it should be warm to the touch). Bake the genoise for about 10 to 12 minutes. Make sure the cake does not over bake and become too dry or it will not roll properly. Once the cake is done (a tester will come out clean and if you press the cake lightly it will spring back), remove it from the oven and let it cool on a rack. Remove the cake from the baking sheet and invert it on a larger piece of parchment paper. Peel of the parchment paper that was lining the baking sheet. 8 to 24 hours ahead of time: line a fine mesh strainer with cheesecloth or coffee filter and place it over a bowl so that it is suspended. Scrape the yogurt in the lined strainer and let it drain, refrigerated. After 8-24 hours (I strain mine overnight), combine the yogurt, sour cream and honey. Whisk well and set aside at room temperature. In a small bowl, sprinkle the gelatin over 1 1/2 Tb water and set aside to bloom for 10 minutes. Make the egg white custard: In a small saucepan, heat up the milk, cream and 2 Tb of the sugar, until the sugar is dissolved and the mixture is almost boiling. In a small bowl, whisk together the egg whites and the 1/4 cup of sugar. Slowly whisk in some of the hot milk to temper the eggs. Add the remaining milk, whisk well, and pour the whole thing back into the pot. Stir constantly over medium heat until the mixture thickens like for a regular egg custard (should coat the back of a spoon). Remove from the heat and stir in the gelatin. Stir well until the gelatin is completely dissolved. Strain the custard through a sieve if necessary. Let cool to room temperature. You can speed up this process by putting your bowl over an ice bath. Once the custard is cooled, stir in the yogurt mixture. Set aside a room temperature until ready to use. 2 cups fresh or frozen raspberries. 1/2 cup heavy cream, whipped to soft peaks with 1-2 Tb sugar. Line a terrine mold with plastic wrap, making sure that it extends over the edges of the pan as it will give you a better grip when you unmold it. 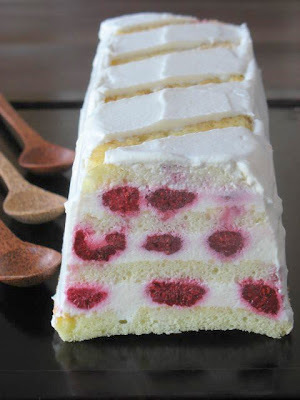 Cut one strip of genoise the same width as the bottom of your terrine. Mine gets wider as you reach the rim of the mold so my pieces are going to get a little wider each time. Spoon about 1/4 cup of the honey panna cotta on top of the cake layer, carefully place raspberries the whole length of the mold, right on top of the panna cotta. Cover with another 1/4 cup of the cream. Cut another piece of the cake and repeat with the panna cotta and raspberries. Repeat the process until you reach the top. Make sure that your last layer ends with a piece of cake as it will be your base when you unmold the pan. Cover with plastic wrap and refrigerate for at least 2 hours or for up to 2 days before serving. Remove the terrine from the refrigerator as well as the plastic wrap on top. Invert the pan onto a serving plate and peel of the plastic wrap that was lining the inside of the mold. 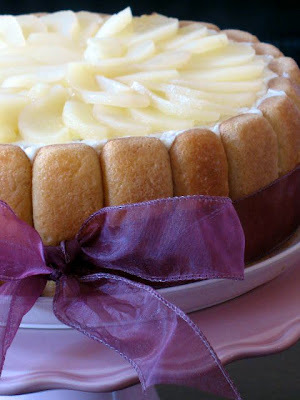 Cover the cake with the whipped cream and keep refrigerated until ready to serve. To make strips: cut out strips of paper the width you desire and lay them on top of the terrine while you spread the whipped cream. Go slow and steady or you will move them at the same time. Peel the strips off and voila! What? 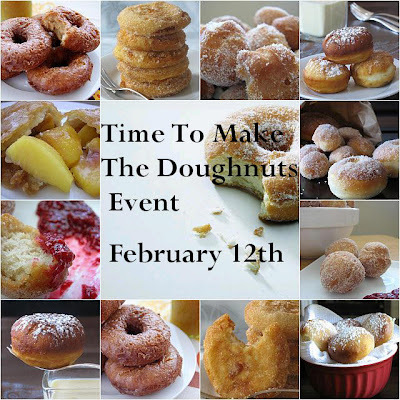 A doughnut event? I am smiling thinking that while you were sleeping and dreaming away, Peabody and I were rubbing our hands together and scheming about an all doughnut fry fest. Oh yeah! Bring it on!! We love anything with butter, flour, eggs and sugar but more so when deep fried and maybe drenched in caramel or toffee sauce! We know you have been craving some doughnut goodness and looking at all the countries around us, we can tell that there are lots of local specialties involving fried dough. We also realize that some of you are paying attention to their waistline this time of year, so we are ok with baked doughnuts, don’t make it a habit though, that will break our hearts! You don’t have to own a deep fryer to participate either, any form of pan frying can do (don’t go justify to your better half your latest appliance purchase and blaming it on us!!). Our only “requirements” are that your entry be a sweet one (plain, or fruit filled or other), and one you make especially for the event….because...well, that's just us! Round up on both our blogs on the 15th! You can also find notification of this even on Is My Blog Burning, graciously maintained by Andrew. I know...I am evil to make apple and cider beignets, to take their pictures and put them here while some of you have made food related New Year's resolutions. I guess now you know that I don't make any...! No, seriously, I do make "adjustments", not resolutions. Just the word puts too much pressure so I make a list of bad habits that I need to correct. Back to the beignets though. If you think about it, I am not really evil if you are tempted by these. Don't they say "an apple a day keeps the doctor away"? And that if you fry things at a high enough temperature, you don't get as much oil in the food? So you see....no evil. Alright, I might be trying to justify the fact that I enjoyed one too many of them tonight but sometimes life is too short to worry about two or three Apple And Cider Beignets. I am not pushing you to throw caution away to the wind but let's face it between two of these and two store bought ones, I know which one I am going for. First, they are made with fresh ingredients that I can pronounce without scratching my head, and second of all who knows what tomorrow holds? I have been craving fruit beignets like these for months but beside the four days we had of cold-er weather, there has never been a "proper"occasion. I can't say "cold" for those of you under really bone chilling conditions or you would laugh at me! Anyway, if I wait for another drop in the temperatures I might have to move up north before the right moment comes along. And really, when is the right moment? My philosophy is that if it is not hurting anybody and not breaking any law, (college days are definitely over), well, now is as good a time as ever! I was going to use one of my mom's recipes until I noticed Kate Zuckerman had a pretty mouth watering one also. She uses light beer in her recipe but I had just opened a bottle of "cidre brut" so I went with that instead. Since one of my New Year's "adjustments" is to try more than one recipe from cookbooks I receive, I went along with hers not knowing that I was in for a surprise. I don't know where she gets her apples but after the four called for in the recipes were all dipped and fried, I still had enough batter for four more! So there I was cleaning and slicing a pineapple as quickly as I could before the oil would turn smokey black. No time to roast the pineapple slices as she does the apples but they still turned out alright. Given more time though, I would have proceeded as she does in the recipe just to avoid too much of a bitey feel from the raw fruit. Consider yourself warned and either pick mammoth sized apples, double on the quantity or prepare other fruits. If you go with canned or jarred ones, make sure to pat them real dry with paper towels as we all have discovered at some point that oil and water don't really like each other, especially at frying temperatures. Preheat the oven to 350F. Peel and core the apples. Slice them into four even doughnut shaped sections, crosswise. Lay the apples on a parchment paper lined baking sheet. Dot them with butter and sprinkle with sugar. Bake until the apples are brown and tender but not completely done. Let them cool to room temperature. While the apples are baking, prepare the batter to fry them. Separate the eggs, reserving the whites. Whisk 3 egg yolks (discard the 4th one or use for something else) with the salt, butter and cider. Add the flour and whisk until smooth. In the bowl of a stand mixer, whisk the egg whites until foamy, add the sugar slowly until you get stiff glossy peaks. Carefully fold the whites into the egg yolk batter. Note about frying: do not overcrowd your pan as it will drop the temperature of the oil and you will have a soggy oily beignet instead of a crispy one. To test if the oil is ready, dip the end of a wooden spoon or dowel in the oil and if you see bubbles at the base touching the oil, it is ready. Heat one cup of oil in a frying pan to 325F. While it is heating up to temperature, mix the last measurement of sugar with the cinnamon in a plate and keep it close as you will dip the beignets in this once they are fried and cooled a bit. Dip each roasted apple slice in the batter, coating both sides and gently lay them down in the oil. Cook 4-6 apple slices depend on the size of your pan, until they start to brown around the edges ( I used an 8inch cast iron one and 4 slices at a time). Using a slotted spoon or spatula, flip the apple over and cook until golden brown. Drain them on paper towels for a minute and dredge them in the cinnamon sugar. Serve as soon as possible or reheat briefly in a pan the day after (if they last that long). P.S: I have read your comments and your emails about the caramel corkscrews and I will make a proper post about those this weekend. 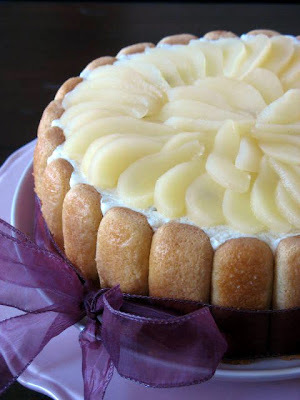 I also got emails about a cake I posted moons ago without writing the recipe down for you, so I will upload that too! Happy New Year! I hope you all had a wonderful holiday filled with family, friends, good times and laughter. We did, kind of mellow some days, kind of crazy some others...waiting for that cold weather to come our way so we could cozy up in front of the fireplace. Well, after temperatures in the 60s and the 70s, we finally have some cold weather. Of course it occurs on January 2nd, Mother Nature scoffing at us now that Santa is long gone and New Year's Eve is simply but a page turned. But you know what? It does not really matter anymore as I did not need the fireplace to make me feel cosy this Christmas season. Nope. I had the warmth of looking at cards every morning upon waking up, looking at my really weird looking Norfolk pine tree. Some were too kind to tell me it looked good....I did not care for it, but it was a gift and it got "prettified" as one of neighbors kids said. Anyways, I was also blessed one Christmas Eve morning when I received a box full of cookies and gifts for the house, (look Lisa! the stars are giving my dessert some spice), a cookbook, The Sweet Life by Kate Zuckerman (see Veronica! already put to good use), and the softest fleece robe courtesy of my mother in law. 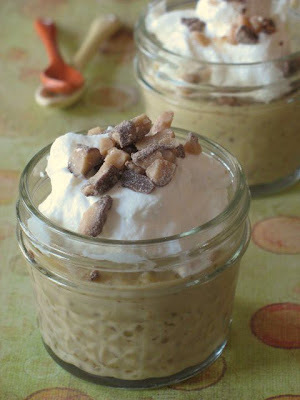 The correlation with Cardamom Caramel Mousse? Well, that Christmas morning I felt really blessed that I could eat one of my friend's cookies, while reading the other friend's cookbook, and all wrapped up in my surrogate mom's gift....Really, it just dawned on me that very minute: "gosh, this is pretty special"...and as I was lost in all things metaphysical (ya'll know I am kidding, right?! ), my hand stopped the pages of the book from turning by pushing on page 106, where Kate Zuckerman wrote the Caramel Mousse. I can see why her recipe is at the backbone of so many of her desserts and the applications and variations on it are almost endless. 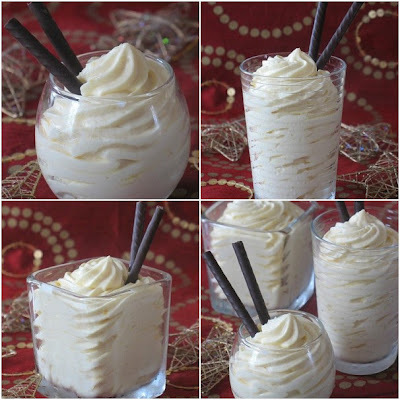 A hot caramel syrup is whipped into egg yolks to create a safe cream to which some gelatin and whipped cream is added. The end result sets rather quickly but the taste is out of this world and the texture...well...soft as a pillow...really. In her original recipe Kate uses cinnamon to spice up the taste, and although I have nothing against cinnamon, I will go for cardamom first if given the choice. 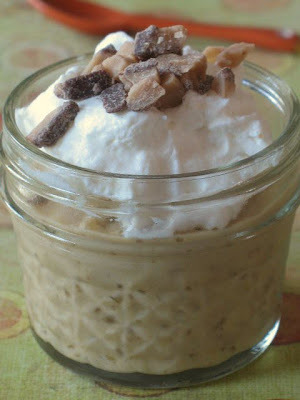 I thought about infusing the caramel syrup for the mousse with some barely crushed open pods. I started looking at the variations given when I noticed that she had a cardamom one, but used just the pods in their original form. Granted they are fragrant on their own, but I feared that the flavor would get lost in the boiling syrup, (even with the 10 pods she uses) so I went for a tiny bit more complication (one day I might play with caramel in a simple way, maybe!). I opened the pods, let them boil with in the caramel, strained the caramel over a bowl and quickly added it to the egg mixture for the mousse. It won't cool the caramel syrup long enough to weaken its emulsifying power for the mousse part. In the bowl of a stand mixer, whisk the egg yolks and the salt. In a small bowl, sprinkle the gelatin over 1/4 cup water, and let it sit while you make the caramel. Combine the sugar, cardamom pods and 1/4cup water in a heavy saucepan. Cover and bring to a rapid boil over medium high heat (prevents crystallization of the sugar on the side of the pan). Once boiling, uncover and cook the sugar until deep golden brown. Turn off the heat and carefully pour 1/4 cup water into the hot caramel. The syrup will bubble and spurt, so stand back.Make sure the water incorporates fully to the syrup. Return to the heat if you get caramel bits and stir until it is one smooth liquid. Strain the pods and seeds in a container with a spout, it will be easier to add the to the yolks. Pour the caramel slowly and into a steady stream into the egg yolks with the machine running on medium high. Melt the gelatin in the microwave for 10 seconds or into the (now empty) saucepan until dissolved. Add it to the yolk mixture and continue to whisk on medium high until it triples in volume and cools to room temperature. In a separate bowl, whip the heavy cream to soft peaks. Add it to the mousse base and fold the two gently together. Divide the mousse into cups, ramequins, dishes, etc...and let it set, covered in the refrigerator for at least 2 hours.